Apart from that, good work on the Car Wreck, perhaps somebody could "spraypaint" a Pigs Head on the Hood and instead of crossing out the A.C.A. just "spraypaint" a B at the end, I mean it's like Arulco's Carabineers are asking for it. Of course from an Immersion point of view you'd be right, but then again, you can make a shitload of money so it would be also immersive to be able to buy real military Hardware like a fleet of Tanks, Helicopter, COIN-Planes etc etc etc but this would all be a little bit over the top, not to mention the amount of work one would have to put into making this possible. So many good ideas and so little time. Finishing the map at some point in time still is one of the biggest achievements in my eyes. if desired point me to an appropriate pig head, which btw is not required to be in the correct angle. to the north you see the Military Part, with the "old Fort" and the Main Gate to the Base, to the East you see the Town's Mining Facilities and then you have the actual Town's Centre, lot's of Houses Shops, small alleyways, corners etc. Zombie, show us the teaser of the new card? I'm already burning with impatience! Note the 3 snipers on the roof, one is mostly covered by the object that could be one of 2 mortar positions. they are already present in sector and will turn hostile with the 1st combat action. Last not least many spies of non domestic factions have strong interest to prevent decapitation. and trigger happier than their representatives in game, aka Ds soldiers, Hicks brothers and Danubian cops. Zombiehunter, I understand that this card will be supplemented? Are you going to upload a new city on github? It would be nice to consider it in more detail..
Not exactly, after all I am just assisting Smeagol with map-making. Planning to finish his work, would mean to replace him and I cannot and I do not want to do that, because in the end it is his project and not mine. With the uploads of the new maps, same thing. When I finish my maps, I will send them to Smeagol, so he can look them over and do some finetuning if necessary and then he will probably upload those maps with the next Release. No Offense, but before asking the same Questions over and over again, please re-read earlier Posts. I will consult Smeagol when I deem the Maps to be finished and then he will make the final call if it's going to be uploaded or needs to be reworked. I thought I made this clear already, this is not my Mod, it is Smeagol's I am merely assisting in getting Maps done and providing new Artwork regarding Vehicles and other Eyecandy for the Maps. As for the City, no it's not a new City these will be totally reworked Sectors of an already existing City, which one is up to you to guess. Which brings me to my next point which details about the new Maps I am providing is my decision and I will not spoonfeed every Information about the new Maps. As a Reminder, this Thread is for you guys to show you, that there is still Progress regarding AIMNAS BigMaps, however there is no Roadmap, Schedule or anything like that. I am doing this voluntarily, unpaid, during my free time, I still got a day to day Job to tend to and also a private life. So long story short, the Maps will be ready, when they're ready, I will provide Information about them as I see fit, WHEN I see fit. Consider this as an Answer to the FAQs. This does sound kind of harsh doesn't it? I'm pretty sure nobody meant to hurry you in any way and everybody sure appreciates your work, at least I definitely do. Like you said, it's just good, a project with such potential is still getting worked on and getting somewhat closer to the finish line with each map. Looking forward to any new update whenever you're ready! Harsh? No, when I wanted my answer to be harsh, then it would sound very different. Having to answer the same Questions over and over and over again, is a somewhat tedious task, especially when people are just lazy to reread the Thread themselves. If the same questions get asked by the same guy who asked me about two weeks ago and got an answer, that is when tedious becomes annoying and that is when I become direct and very specific in my answers. I am happy when the work is appreciated, but to be perfectly honest here, working on this mod is somewhat self-interest, because I want to play this mod just as much as the next guy. Bottom Line if someone is happy with my work, good. If not, I couldn't care less because I am doing this for fun and I am not a service provider. Zombiehunter, My apologies. I have a poor command of English, and Google translator sometimes distorts the meaning. And your message is just missed from inattention. Sorry again, if you are troubled, I'll wait for the end of the work in silence. @Zombiehunter I'm from China. Your work is very good. In the top left sector you see the Army Headquarters, Dining Facilities, Main Armory, Sports Facilities, a lot of Housing for Regular Forces and also Special Forces and a Helipad. Bottom Left Sector is the Military Prison, also we got the Water Treatment Plant for the Base, some more Housing and also a small Workshop with adjacent Vehicle Depot. In the Civilian Part we have a carpentry shop, a bakery, a "Supermarket" and a shop for Militaria Enthusiasts and of course a lot of Civilian Housing. The Civilian Part consists of Alma's local A.C.A. Station, a furniture Shop (Arulco's IKEA knockoff ), the Mine, a Restaurant, some Bar's, a Garage a lot of small shop's, gimmicks and so on. Alma has always been the center of Arulco's Military even before Deidranna came to power, but before then Arulco had no need for a huge Military and Alma was mainly a bootcamp for the new Soldiers and the Headquarters for the Brass. The Civilian Part of Alma used to be much larger and the Military mainly occupied the Area around the old Fort. The Military's role back then was mainly representative duties and Border Protection together with the Carabineers which also always had their HQ in Alma and because they're somewhat part of the Military. Anyways, when Deidranna came to power and turned Arulco in the oppressive Dictatorship it is today, her need arose for a larger Military to keep the Population in Line and so Alma Base had to grow. A lot of surrounding Land needed to be requistioned and the Landowners were simply dispossessed. There was a lot of resistance and even violence, but in the End who resisted simply disappeared and was never heard of again and in the end the resistance against the forced Land Requisitions faltered. Today mainly Miners and Military Families live in Alma, the Military Families are staunch supporters of Deidranna's rule, while the Miners have somewhat mixed feelings because of the working conditions, this causes for some friction in day-to-day live in Alma, but of course none of the Miners would really start an argument or even a fight with one of the Militaries, in the end they'd just disappear as it has happened before. And then you still have some of the old Landowners of Alma, those who were lucky not to get disowned or who did not resist when it came to it. Those who are old enough to remember the Requistions and the Violence mainly keep to themselves, remembering and shivering at the Horrors their neighbours had to endure during that time. Seeing all of this together, I can just imagine how much work it was. What else needs to be done until this great part is finished? Is it on purpose that only the top left sector has lights or is that one of the points needed to be finished? 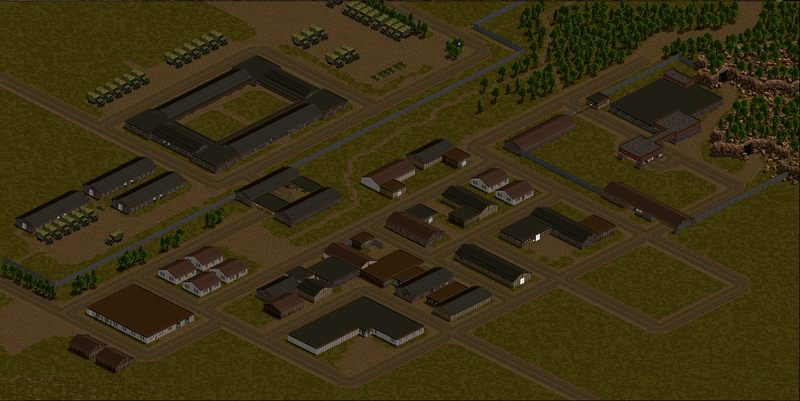 Great stuff by the way, it is coming as close as possible to a real military city I'd say. You definitely paid attention to detail. preferably related to sectors loyalty and/or prógress rate. Btw i think it would be pretty immersive if the game keeps the graffity of mercs who died. A Bordersector on Arulco's Eastern Border and by now the 7th Map I've worked on as of recently. Maps have so called 'entry points' that are used when entering a map. AI soldiers also spawn in selected spawn points in a map, so this is no problem (else we'd have exactly that problem in Alma sectors). 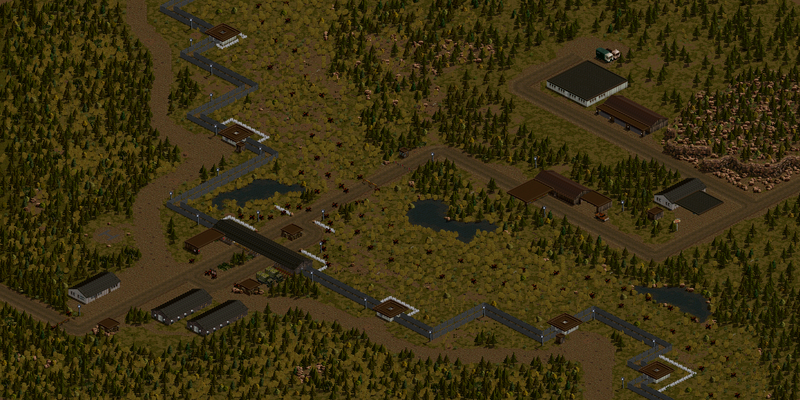 Again we have Bordersector in the Eastern Provinces, alot of Wilderness going on and the Entrance to an abandoned Mine. Who knows what we'll find there? Treasure? Loot? The Meaning of Life? 1. Yeah getting this stuff together is actually a shitload of work, especially since I need to look out for the stuff fitting together, the great improvement of BigMaps from Vanilla Maps no more small cutouts from a theoretically much larger Map. I used a level of detail I am particular proud of on this Map, without overloading it with doodads, stuff and debris. Question, maybe at this zoom level I can't see, but for immersion's sake: Presumably there are border crossing points where people can actually cross the border without hopping a fence? Thank you guys for the great work! I startet a new campaign a few days ago and I really enjoy the game. So here you go, at the moment Arulco has two Border crossings, one in the North made by smeagol and this one is the Eastern Crossing made by me and I've planned a third one in the South near Balime. Wow! Having tried to do something similar with cliffs myself, and failing, I am suitably impressed by the multiple independent cliff areas! Well done! May i ask which frames of the sti/jsd respectively cliffs from which tileset folder cause the glitch? perhaps you can fix the glitch by using one of the 3 .jsd files in all subfolders, just dont ask me which one. 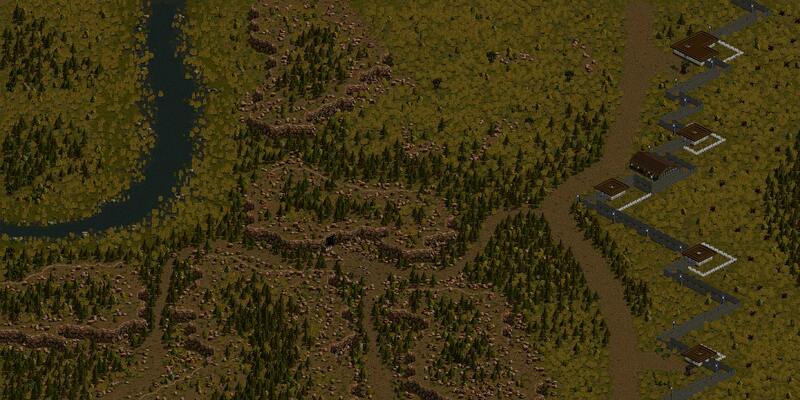 Gosh dangit Zombiehunter, your maps are incoming like an airstrike, awesome. I really like the border setup, especially the last part with the border passing area. The Lakearea East of Alma, on the Southern End I tried to simulate a little Waterfall, there are also four Springs which are feeding all the Rivers and Lakes right up to Drassen Lake. Yay, finally a place to recuperate oneself. As an inspiration, maybe a small abandoned fishing shack along the shore would round off the scene. I already thought about that, but after a long consideration I decided against it. This was by far the most difficult map to design, I had to delete the first try and start all over because the beloved Cliffs gave me Glitches like hell, but now it's fine and finished. as those passages appear rather narrow for spies to pass hostile officers succesfully. 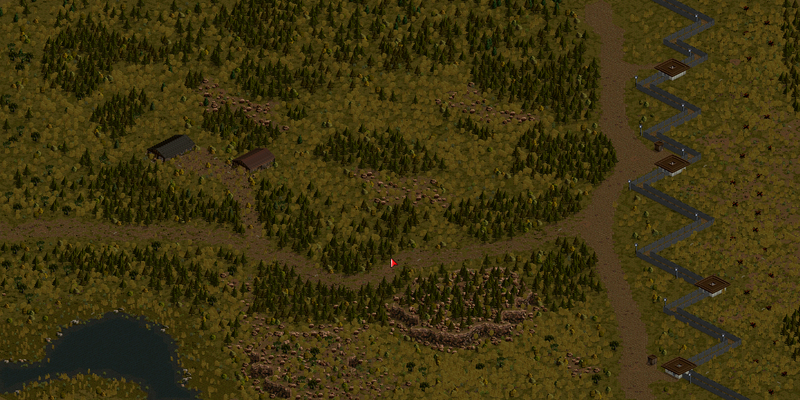 Do my eyes spot a mine entrance? Just a quick word of thanks for your continued work on BigMaps. Looking great! I hope your creative streak will continue. This Map is almost finished, in the center there is some sort of FOB for Border Protection, because the River is the Border to another neighbour of Arulco. There are still a lot of greebles and small Details to be added, the Buildings at the FOB still have no interior.